I know, you just want me to show you the scorecard and associated secret formula investors use to decide a supposedly “fair” valuation for your company. Unfortunately, you are only allowed access to that information once you’ve become an accredited investor, pass the extremely difficult valuation certification test and finally swear yourself to secrecy, with an implanted microchip under your skin for enforcement. Haven’t you wondered why investors act so sketchy when you try to get them to explain how they came up with a proposed valuation for your company? Of course you know I’m playing into the mystery, confusion and seeming inconsistencies related to establishing and negotiating valuation for a round of funding. This article demystifies the process many investors go through for early stage rounds of funding (seed and Series A) while also providing valuable tools to help you prepare for the inevitable negotiation. Side Note: I often remind entrepreneurs that valuation is only one key term among several that get negotiated in a round of funding. If you get infatuated with the valuation and ignore the other key terms, you can be left with a terrible result. For more insights into this, see my article titled “Tell Me Your Price and I’ll Tell You My Terms”. This article is written mostly in context of an equity round of funding in which your valuation is set as a key term (aka – “priced round”). However, realize that many of the concepts I describe and recommendations I make also apply to raising a round of funding with a convertible security like a convertible note or SAFE (see related article titled “Reviewing the SAFE Investment Instrument”), which have a term called a “Valuation Cap” (aka – the “cap”). The cap doesn’t exactly set your valuation today but since it could end up serving as the valuation used for converting into equity in the future, it is the most commonly negotiated term. In the early days (pre-seed, seed and even Series A), establishing and negotiating valuation for fundraising purposes is more art than science. This changes over time to the point where the determination of your valuation for an IPO is completely the opposite – much more science than art. 409A – A formal report that is produced by a certified professional that uses multiple different mathematical methods to value your company’s various classes of stock. Discounted Cash Flow (DCF) – Uses future cash flow projections and discounts them to a present value by using an assumed cost of capital. Multiple of Revenue or EBITDA – Valuations are sometimes set or influenced based on a multiple of the target company’s annual revenue or EBITDA earnings. Investors don’t focus on valuation until they’ve learned enough to decide if they have genuine interest in investing in the first place. If they determine they do, some of the information they discovered during the evaluation also goes into their decision about a reasonable or proposed valuation. Take note of the graphic below to better understand the type of things investors most closely evaluate as your company evolves from pre-launch to early revenue to Series A.
You’ll notice that evaluation of your team is important through all early stages of funding but beyond that there are some notable differences. Pre-seed – When you don’t yet have a product in the market, the investors can only additionally evaluate the hope, vision and potential you are describing. Is it sound and based on significant customer discovery performed by you and your co-founders? Is it exciting and innovative enough to have a chance of making a big impact on the market you’re targeting? Seed – You now probably have a finished product and maybe some very early revenue, but not enough to make fancy trend graphs. Therefore, the investors evaluate the product’s functionality and feedback from your beta customers to confirm it actually solves the stated problem. They also evaluate various aspects of your business plan, including your market size and other important attributes (see related article titled “Sizing Your Market“), competitive analysis, customer acquisition strategy and monetization strategy. Series A – Investors are finally able to evaluate your track record of operational and financial performance with a whole host of metrics and trends that you will provide them. They will also want to understand the way you run the company, how you make decisions and the culture that is developing. 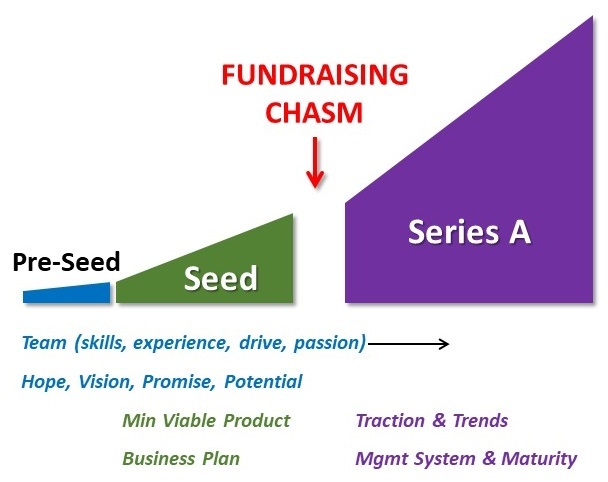 The concept of the “fundraising chasm” isn’t central to this article but if you’re interested in learning more about it, you can find that article here. Let’s assume you favorably passed the investor’s early evaluation and they’re interested in pursuing an investment. How do they go about deciding what valuation is reasonable for them? It’s probably obvious that each investor has their own approach. But when it comes to institutional investors (ie – VC’s or managed family funds) and many angel syndicates, I’ve found there is a common sequence of events that typically occurs behind the curtain. Institutional investors see tons of deals. This means that after completing their initial evaluation, they are able to “pattern match” your opportunity with several others. They have this ability to size up various aspects of your business plan and strategy to magically match it up with other deals they’ve invested in themselves, ones in which they decided to pass and also ones they lost to other lead investors. This evaluation of comparables gives them their starting point for valuation. Since the pattern matching exercise surely didn’t result in an exact match to other recent deals they felt had a fair valuation, the investor will need to make some adjustments. During their initial evaluation they likely discovered some things that especially impressed them or especially concerned them. These become additions or subtractions from their starting valuation. Maybe you have a superstar on the founding team or have already landed a significant strategic partnership (valuation boosters). Or maybe you had a recent pivot that’s not yet proven or an excessively high churn rate (valuation subtractors). Many institutional investors have a target equity amount they need to get when they invest and sometimes this is specifically described in the fund’s prospectus (PPM) that was shared with their limited partners while the fund was being raised. Some investors have a fairly strict equity target while others have a more flexible and general rule-of-thumb. If their target is 18-20% and their comparables + adjustments steps result in a valuation that only gets them 15%, they’ll likely reduce their proposed valuation to get back into their target range. Early stage investors are taking much more risk than late stage investors. As a result, they often make investment decisions based on the likelihood of getting at least a 10X return. So the final stage in their process to come up with a suggested valuation calls for them to run various exit scenarios. The most important scenario solves for a very specific question. What valuation would you need to be acquired for (or go public for) in order to give the investor a 10X return and assuming you need to raise additional rounds of funding in the future, each diluting the investor an assumed amount? Let’s run the calculation for a $2M investment that yields the investor 20% initial equity and let’s assume two more round of funding that are each 30% dilutive before an eventual exit. Now re-run the calculation with some variations the investor will be thinking about. What if …. Each of the above happens with the 35% dilution assumption? It seems logical to me that this imaginary investor will be evaluating the odds you can reach an exit somewhere in the range of $150 – 300M and will be thinking about the remote possibility that your exit might need to reach $550M. Now you can probably understand why VC’s are looking for businesses that can grow to the point of being able to exit for hundreds of millions of dollar and not just tens of millions. There are a million things that can kill an early stage company. An investor won’t list them all or be freaked out by that possibility, but they will attempt to identify any significant risks to building both a viable and scalable company because that’s required to reach their goal of a 10X or greater return. You might be mostly focused on raising enough money to get to the next key phase in your evolution but the investor is imagining a path all the way to exit. Most of the steps outlined above also apply to angel investors, who typically invest in pre-seed and seed rounds of funding when the company is very early in its evolution and might be generating only very little revenue, if any. Comparables, Adjustments and Death Threats are the methods they rely on the most with some also evaluating the Potential Exit Return. Angels rarely have a target equity requirement. Since the valuation you’re able to negotiate is such a key aspect to your funding round, why not go ahead and put the investor’s hat on and go through the same steps they go through? Find other recently funded companies that look like you – similar funding, amount of traction, stage, market size, experience amongst founding team, etc. What range of valuations were they able to negotiate? What positive and negative adjustments can you identify are possible? Can you immediately start working on any of the negative adjustments? Can you quickly add more positive adjustments? For the VCs you’re targeting, do they have a target equity amount and, if so, what is it? You probably won’t find this information on their website but might be able to talk to some founders in their portfolio or founders that pitched them but didn’t get a term sheet. Maybe your advisors know the answer or can find out. What sort of future exit do you need in order for your prospective lead investor to get a 10X multiple with the valuation you’re hoping for? Notice that I haven’t mentioned the factor of the equity you or your co-founders will end up with after getting diluted due to the new funding raised. I realize you are acutely aware of this dilution and are probably hypersensitive about it. But, unfortunately, this isn’t something the investor is concerned about. It’s true that some rules of thumb exist for the minimum equity the CEO and other key executives should have in order for them to remain motivated to work towards a big exit. But that’s more of a sanity check than a key step in determining valuation. Said a different way, even if it’s true don’t tell the investor you’re expecting a $___M valuation because it allows you to remain with ___% equity after dilution. That’s your problem, not theirs. Which is the best approach to take? Well, you can find lots of articles and books on negotiations that explain the pros and cons of anchoring the conversation. Doing so creates a cognitive bias that causes the other party to more heavily rely on that initial piece of information offered. If the investor anchors the conversation by suggesting a $2M pre-money valuation and then, through discussions and more evaluation, decides to come up to $3M, you might have the feeling that it’s a great deal and even more than if they started with $3M and remained firm on that number. The outcome is the same but, somehow, you feel differently in the two situations. Having said this, don’t assume you can tell an investor you’re expecting a $10M valuation in hopes that negotiating down to $5-6M will leave them feeling like they got a great deal. Your mention of a valuation that seems ridiculously high can easily terminate the investor’s evaluation. I don’t have a single recommendation in regard to who mentions valuation first because every situation is different. I do believe you should decide on a range of valuations you think is reasonable and would be acceptable to you and your key stakeholders. The investors will realize their feedback will come into play when you approach them later for actual funding, which means they’re likely to squirm a little bit on whatever valuation you suggest. Squirming a little is fine but throwing a shoe at you or falling on the floor and faking a heart attack isn’t. And in either case you should be able to get some early guidance if you do this with multiple prospective investors. Let’s say a prospective lead investor gives you a term sheet that includes reasonable terms in general but the valuation is considerably lower than you expected and also below the range you and your key stakeholders previously agreed would be acceptable. Now what? Your first and most significant negotiating tool is ALTERNATIVES. Many negotiating articles and books talk about the importance of understanding what’s called your BATNA (best alternative to a negotiated agreement). Do you have any other term sheets for a similar amount of funding? If not, are others likely to come soon? Must you raise money now or do you have an option to execute for at least a few more months before needing fresh funding? If you don’t have other active investor prospects but do have some runway left, you could put your head down and execute like crazy while “fixing” some of the things that prevented you from getting the valuation you needed. If you don’t have one or more of these alternatives available, you are pretty much at the mercy of the single investor and will need to use the additional negotiating tools described next. Your second negotiating tool is to deconstruct their evaluation of your company and debate anything that doesn’t seem right. Most likely this involves finding out the concerns they had (valuation subtractors) and trying to convince the investor they shouldn’t be as concerned. You will also want to try and make sure they are giving you credit for things you feel are deserved. Just realize there isn’t any sort of “price list” that matches dollar amounts to these things. It’s more subjective than that. Your third negotiating tool is to see if there are other terms in the term sheet that you can trade for an increased valuation. Would they come up on valuation if you adjusted the voting rights, board of director make-up, option pool size, etc? You would only want to offer this with the advice of an experienced attorney because you could otherwise accidentally do yourself harm. Remember my saying “tell me your price and I’ll tell you my terms”. Your fourth negotiating tool comes into play if the lead investor is only taking half or less of the total funding round. With this, you might be willing to offer extra equity to the lead investor via Warrants in exchange for a higher valuation. The lead investor will still get their target equity (or maybe close enough) and the other investors that fill in the rest of the round will invest at the higher, more acceptable valuation. Even with the extra equity offered via Warrant, you might come out better in terms of overall dilution. The truth is you’re only worth what someone else will agree to. If you find yourself having the same valuation argument with numerous investors, I’m sorry to say this but you aren’t worth as much as you thought! Additionally, fundraising is a very time consuming activity for key stakeholders in your company. Stretching things out or continuing to seek other investors that will agree to your desired valuation can be counterproductive and maybe to the point of seriously hurting your company. Finding a good investment partner that can help you grow a great company is far more valuable than a mediocre one that will give you a slightly better valuation. Although setting and negotiating valuation for early stage rounds of funding or more art than science, hopefully you’ve learned a few things that can better prepare you. And hopefully you’ve also realized there are numerous things you can do well in advance of a funding round in order to set the stage for the highest reasonable valuation. Don’t wait until it’s too late to have any influence!! !